Berg Lake Trail – Cycling permitted on the 7 km section from the trail head to the north end of Kinney Lake. A bike rack is located at Kinney Lake. The trail follows the river for most of the way. Note the milky turquoise-blue color of the glacier fed river as it roars down along the trail. Once you arrive at Kinney Lake and if the weather is clear, you will never forget the fantastic view of mountain and glacier reflecting in the calm water. It’s a classic shot of British Columbia beauty. Corridor – Trans Mountain Pipeline offers relatively flat terrain that parallels the highway corridor and is well suited for a family ride or beginners. The pipeline right of way west of Hargreaves Road is private property and is closed to public use. Robson Meadows – Various cycling opportunities exist in the immediate area. This is a beautiful forested area by the Fraser River. Interesting trails allow you to experience the nature wonder of Mt. Robson. Close to the Visitor Center, store and restaurant. 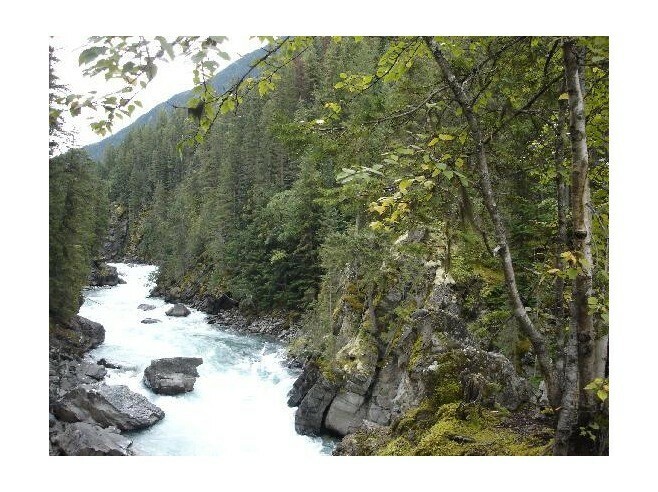 Robson River – Another beautiful forested area by the Robson River. Easy walking distance to the Mount Robson Park’s Visitor Centre and the famous Berg Lake Trail, restaurant and store. Keep in mind: Pedestrians have the right of way and so do horses, so if you encounter horses on the trail, please dismount and let them pass. Bicycle helmets are mandatory in British Columbia. There are no bicycle rentals available at the park. A company in Jasper, Alberta – called Freewheel Cycle offers bicycle rentals. Don’t approach wildlife, a bell is nice for announcing your presence. This summer, choose the closest inn to Mt Robson for great lodging in a stunningly beautiful setting – River Mountain Lodge.